The ubiquitous woven chair seat. Most chairs are older than we are and will be here long after we are gone. They are found in every country across the globe, yet somehow caning is now considered a dying or lost art. Van Gogh and Matisse painted them. Presidents and kings have sat in them. They have collected dust in attics and barns for decades. They have been tossed to the corner because they needed a new seat. Although we are living in a disposable society, we are concurrently in the middle of a craft revival. Many people are realizing the value of a hand made object and are paying a little more for quality instead of quantity, opting to restore instead of dispose. We love to geek out on chairs and tell visitors about the long and varied history of weaving from China and Egypt to Denmark, France, and England, from Bali to Asheville, North Carolina. Appalachian culture includes woven chairs made from trees found on site, using what was on hand, using every part of the tree. Because of this limited historical view, chair caning is considered a “folk” or “heritage” craft. This view obscures chair caning’s diverse role in global history and furniture design. 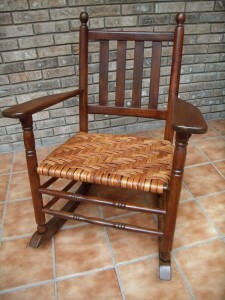 Grandma would be proud to see her chair restored like this. 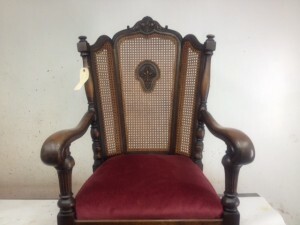 Most of the chairs that come through our shop have a family history. We hear the unique story of the chair and by re-telling the story and restoring the chair, the chair takes on a life of its own. Human being are hard wired to tell their story, and to create art. We are honored to work with these chairs, to be a link in generation, to revive the art of chair caning. Our mission is to cultivate and inspire a reverence for a world wide chair caning legacy. Our vision is promoting an enthusiasm for the craft through restoration, education, and travel. 1. Honoring a family tradition of weaving and an entrepreneurial spirit. 2. Refinement of centuries old techniques and methods. 3. Dedication to high standards of restoration in a disposable society. 4. Teaching a skill: working with your hands to create a tangible, functional, and beautiful object. 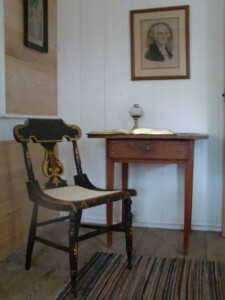 As Benno M. Forman stated in American Seating Furniture 1630-1730, chairs are documents and caners are historians who preserve centuries of designs and techniques. Chair caning is not only important, it is cool! Caned patterns are seen on the runways of Paris and are stamped on Dior cosmetic cases, eyeshadows, and even expensive leather boots. I own an Ann Taylor dress with cane pattern and have seen cane designs on eyeglasses, bedspreads, pillows, and handbags. From the perspective of a fourth generation chair caner who is currently making a living with chair caning, I inherently believe that chair caning is NOT a lost art. Instead it is flourishing in a state of grass roots regeneration throughout the country and the world. Recently I have discovered dozens of chair caners all over the globe. It is exciting to see this craft happening with a younger generation. Yes, I do have plans for a World Chair Caning Tour….but first, I begin in my own back yard where the highest concentration of chair caners are found…Appalachia. Buckle up!